When I first started looking at the Kirtland Egyptian Papers in detail on the Joseph Smith Papers site, I was immediately struck by the surprisingly specific and narrowly focused content in the Egyptian Alphabet and Grammar, which are often said to have been developed as the bogus tools Joseph used to produce his "translation" of a handful of symbols to create the Book of Abraham. If the Alphabet and Grammar were imagined to be tools for cracking the Egyptian language, one might expect them to provide vocabulary for a wide range of common words. Instead, we see a small number of characters considered and they are linked to very specific phrases and names that are found in the Book of Abraham. Is it more plausible that the text in the Alphabet and Grammar has been lifted from the Book of Abraham, or that the tools developed for translation happened to be the intricate puzzle pieces that fit together to well to create the coherent story of the Book of Abraham? 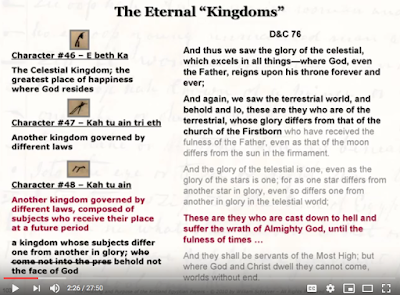 Yes, after noticing this, I recalled that these issues were the topic of an old FAIRMormon Conference presentation given by William Schryver (see Youtube videos of Part 1 and Part 2 of his presentation). I think his 2010 presentation made some important points. It may be that the relationship between the content of the Book of Abraham and the focused content of the Alphabet and Grammar suggests that much of the Book of Abraham translation had been completed in 1835 and was being relied on in some way when the Alphabet and Grammar were constructed. There may have been further "translation" work that Joseph mentioned in Nov. 1835 and again in 1842, but it may have involved adding Hebrew terms, editing some of the content, preparing figures, or simply preparing the whole text properly for publication, as opposed to dictating new verses. "Translation" can cover a wide range of actions. Schryver says there is too much very specific content in the Alphabet and Grammar for it to not be derived from the Book of Abraham, and too little of the Book of Abraham in the Alphabet and Grammar for it to have been used to produce the text. It genuinely looks like a one-way dependency that requires the Book of Abraham text came first. Schryver shows that the brief Alphabet relies on part of Abraham 1, 2, and 3, while the Grammar adds dependency on Abraham 4 and 5 as well, with added dependency on Abraham 2. But oddly, the dependency goes beyond the text of the Book of Abraham alone, and also extends to some of Joseph's revelations in the Doctrine and Covenants (see the second image below, for example). This was at a time when there were serious concerns about enemies of the Church, resulting in some details such as people's names in part of the Doctrine and Covenants being encrypted. Schryver then disagrees with Hugh Nibley, who saw the Alphabet and Grammar as an attempt to reverse engineer Joseph's translation. Schryver instead sees it as something much different, an attempt to create a "reverse cipher" not to decrypt Egyptian, but to encrypt information in English prompted perhaps by security needs. I'm not sure about this particular explanation for what was going on with the Alphabet and Grammar. Whether a "reverse cipher" was the intent or not, the critical thing from my perspective is the possibility that much of the Book of Abraham may have been in place before the Alphabet and Grammar was pursued, strengthening the case that those documents do not give us a window in Joseph Smith's translation and revelation methodology. Here is one slide from Part 1 of Schryver, showing the intricate relationship between Joseph's comments for Facsimile 2 and the comments in the Grammar for one particular character. Characters 46 to 49 correspond to content in the same order and with very similar language in Section 76. Clearly, the Grammar is drawing upon existing text in this case, and it is reasonable to understand that other cases of detailed textual correspondence with the Book of Abraham text represent the same phenomenon, regardless of whatever goal was motivating the men seeking to construct the Grammar. Ah-broam— signifies The father of the faithful, the first right, the elders ... — A follower of rightiousness— ... One who possesses great Knowledge— ... A follower of righteousness, a possessor of greater knowledge. ... — Ah-bra-oam. The father of many nations, a prince of peace, one who keeps the commandments of God, a patriarch, a rightful heir, a high priest. The Egyptian Alphabet, Document B (circa early July to roughly November 1835) which contains phrases like, "The land of Egypt first discovered under water by a woman," "virgin princess," and on a scrap at the end, "Kolob," all important concepts in the Book of Abraham. These terms also occur several times in the the Grammar and in the Egyptian Alphabet, Document B. 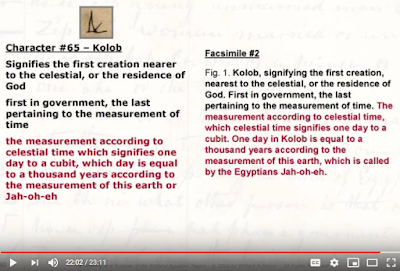 "The land of Egypt which was first discovered by a woman <​wh[i]le underwater​>, and afterwards settled by her Sons she being a daughter of Ham"
Schryver emphasizes the strange Egyptian Counting document, which uses characters from a variety of scripts other than Egyptian (Arabic, Sanskrit, etc.) to depict supposed Egyptian names for numbers. Schryver seems justified in claiming that something other than "translating" Egyptian is going on here, and there may be merit in his hypothesis that a cipher was being contemplated to encode meaning rather than to decode Egyptian, at least for this document. The following slide from about 17 minutes into Part 2 of Schryver's presentation makes a fascinating point: not only are the characters in the Egyptian Counting document not Egyptian at all (like some of the other characters in the Alphabet and Grammar), but six of them come from W.W. Phelp's earlier work in trying to create a way to write in "the pure language." This early "pure language" work occurred well before Joseph saw an Egyptian mummy or scroll. So here are six characters from Phelps early work that show up in the "Egyptian" Counting document. What do they mean? Schryver argues persuasively that this rules out the idea that his document was intended to turn Egyptian into English, but was part of a cipher key for turning English into code, or even into "pure language" which Phelps and others may have believed was what ancient Egyptian sort of was. Thus, work on this cipher key, for turning English into code, could well have been viewed as "translating" and as work aiming at developing a "pure language" or, in a sense, "Egyptian," but without the need for actual Egyptian characters from any scroll. Indeed, some of the characters in the Kirtland Egyptian Paper are Sanskrit, Masonic ciphers, variations of Arabic numbers, composite characters, etc., along with many Egyptian characters. As Nibley has long pointed out, this project, whatever it was, soon ran out of steam and didn't really go anywhere, though the documents continue to confound and puzzle us. I think at least some of Schryver's points merit careful consideration, even though the relationship between the characters in the Book of Abraham manuscripts and the Joseph Smith Papyri could still suggest that someone (W.W. Phelps, for example?) thought there was a close relationship between those characters and the translated text. But if the translated text came first, then again what we are seeing is not a window into how Joseph did his translation in the first place. 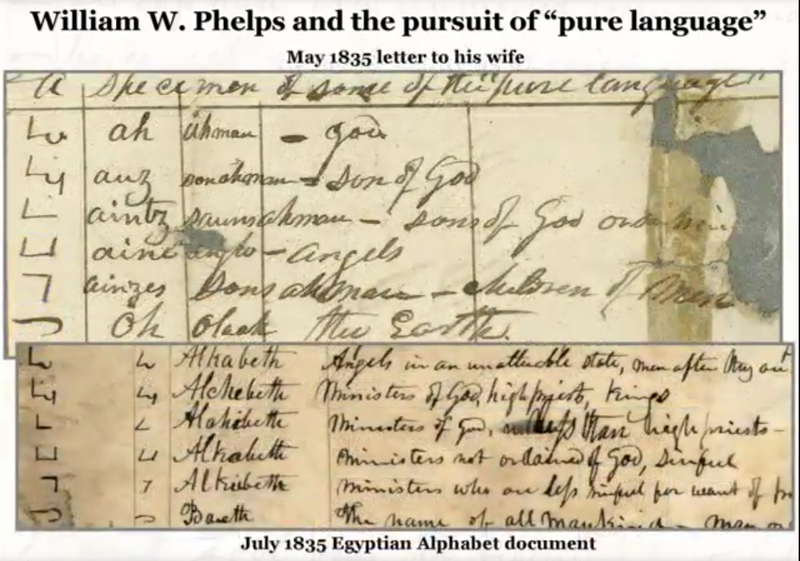 Maybe he was interested in Phelps' project intellectually, just as he sought to learn Hebrew after doing the translation of the Book of Mormon, but using an Alphabet and Grammar is not how he did any revealed translation, as far as we know. Certainly there are weaknesses in the cipher theory, and critics were declaring they had thrashed Schryver shortly after his presentation. But have they really undermined the case for one-way dependence of the Alphabet and Grammar drawing upon an existing Book of Abraham translation rather than the Book of Abraham being created from the Alphabet and Grammar? Has anyone refuted the claim that the characters in the Egyptian Counting document and related papers are not all Egyptian? But wait, isn't it clear that Documents A and B of the Egyptian Alphabet show that they were simultaneously dictated manuscripts, created as Joseph Smith no doubt was pretending to receive revelation for the meaning of the a few symbols? Aren't these smoking guns that PROVE that Joseph was translating from the Joseph Smith papyri, not a lost manuscript, and that these are the originals of the Book of Abraham, not a copied text from a lost manuscript? That's the topic of my next post.